Dam is constructed across the main water feeding river. Examples Tarbela, Mangla, Simly, Hub dam. To increase the water availability water from other rivers may be diverted to the dam through feeder channels e.g. Kurram Tangi dam. Dam is constructed on a channel having much smaller flow. Major storage water is transferred from a different nearby river. This is done due to non-availability of suitable/economic dam site on the major flow river. Example Akhori dam, Replacement dams for Mangla and Tarbela. Water is stored and later released through an outlet for consumptive or non-consumptive purposes as per requirements. There is no outlet provided to release water and all incoming water is retained. The water infiltrates through the foundation and/or dam body. The main purpose of the dam is to induce recharge to ground water system in the area. Small release in d/s channel to allow seepage in the channel bed. These dams are used to retard the peak flow of flash floods. There may or may not be any control over the outflow. For no control over the outflow the outflow rate varies as function of storage volume / water depth in the dam. The flood peak is thus considerably attenuated. The outlet capacity is set that maximum outflow discharge do not exceed the safe capacity of the downstream river during highest flood. The reservoir empties fully after the flood. For control on outflow by gates (detention dam) , the flow is released in such a pattern to retain the water for long time but there is enough storage available to store next flood event. These dams are usually meant to reduce flood damages as well as to induce maximum recharge in the area. One type of such dam is a porous dam built of a porous embankment, e.g. stone gabions. These dams are constructed away from any river along a topographic slope by constructing small dikes on three or all four sides to store slurry / waste of mineral mining and processing facilities. The water evaporates or is evacuated and the solid contents dry up filling up the storage capacity. These are hydraulic structures with a main purpose to raise water level to divert flow into the off taking channels / canals/ hydropower pressure tunnels and penstock. These are preferably called as barrage or canal head works. The storage created by these is minimal. E.g. Patrind Weir. These are small temporary dams built across the river on upstream and downstream side of the main dam in order to keep the flow away and the working area dry. The u/s coffer dam causes the flow through the diversion system and d/s coffer dam prevents the flooding of the working from backwater effects. After completion of the main dam the u/s coffer is usually abandoned and drowns in the reservoir while d/s coffer dam is dismantled and removed. Flow is not allowed over the embankment crest for reasons of dam safety. (earth, rock) dams. USBR defined small dam as one having maximum height < 15 m (50 ft). Unique: Dams exceeding 100 m are considered as unique. Every aspect of its design and construction must be treated as a problem specifically related to that particular site. Seasonal dams are filled and then emptied within the same water year (September to August). Example Tarbela dam. Thus water level in the dam varies from maximum (normal conservation level) to minimum (dead storage level) in most years. Such dams have annual releases usually equal or little more than the minimum annual flow. For very wet or very dry years the reservoir may not reach the extreme levels. The seasonal dams spread the water stored in wet months over to dry months in the same year. Filling and emptying of a carry-over dam reservoir continues over more than one year (e.g. 4 to 5 years). Example. Hub Dam, Kurram Tangi Dam. Thus water stored in wet years may be released during subsequent dry years The annual releases are usually more than minimum annual flow but equal to long term average annual flow. Applicable where wide variations in annual flows. Carry over dams spread storage during wet years/months over to dry years and months. These are constructed of selected soils (0.001 ≤ d ≤ 100 mm) compacted uniformly and intensively in relatively thin layers (20 to 60 ± cm) and at controlled optimum moisture content. Compacted natural soils form more than 50% of the fill Material. 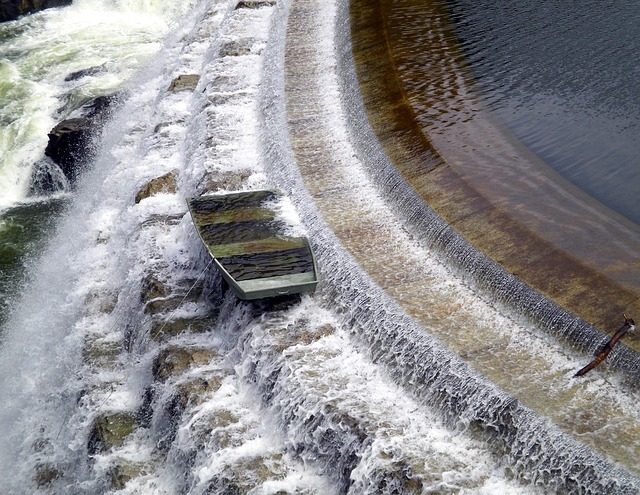 Dams may be designed as: Homogeneous, Zoned or with impermeable core. Zoned part is made of relatively finer material that reduces seepage flow, e.g. clay. The fill material is placed as rolled, hydraulic fill or semi-hydraulic fill. Over 50% of fill material be of class ‘rock’ usually a graded rockfill (0.1 ≤ d ≤ 1000 mm) is filled in bulk or compacted in thin layers by heavy plant. Some impervious membranes/materials are placed in the interior or on u/s face of the embankment to stop/reduce seepage through the dam embankment. Dams section may be homogeneous, zoned, with impermeable core, or with asphalt or cement concrete face. Zoned part is made of relatively finer material that reduces seepage flow, e.g. clay. Core is made of clay, concrete, asphalt concrete etc. These dams are made of mix of large proportions of earthfill and rockfill materials. Rubble/random/stone masonry to fill dam section. Concrete / mass concrete as bulk material in dam section with steeper side slope. RCC section to take loadings, thus decrease section. Gravity dam: Stability due to its mass. Dam straight or slightly curved u/s in plan (no arch action). The u/s face is vertical or nearly vertical, d/s sloping. Buttress dam: It consists of continuous u/s face supported at regular intervals by d/s buttress (massive buttress /diamond head, round head) with each section separate. Ambursen / flat slab buttress / decked buttress. Arch dam: Arch dam has considerable u/s plan curvature. U/s and d/s faces are nearly straight / vertical. Water loads are transferred onto the abutments or valley sides by arch action. Arch dam is structurally more efficient than concrete gravity dams (requires only 10-20% concrete). However abutment strength and geologic stability is critical to the structural integrity and safety of the dam. Multiple arch dams. Cupola/Dome/Double curvature dam: U/s & d/s faces curved in plan and profile section, curved in plan as well/ as arch (Part of a dome or shell structure). The bulk of the dam is made of timber braces with timber board facings. Such dams were mostly constructed by early gold miners in California USA for obtaining river water for separating gold dust and getting water power; such dams are not practically used any longer. The face of earthfill or rockfill dams may be also fitted with timber board for seepage control.